You’re thinking about buying your first woven wrap, but don’t know where to start? How do you decide what clothes you buy for yourself or your child? You pick something by the looks, available in your size, that fits your budget. After wearing/trying it you decide how you like it and you might continue and buy more of the brand, or if you don’t like it you could tell what it is what you don’t like and you will search for another brand that suits your preferences. Right? It’s the same thing with woven wraps! It’s the most versatile babywearing option and will suit every body size (depending on the length). There are woven wraps for (almost) every budget, maybe you already noticed some wraps selling for extremely high prices (1000 or even 2000usd!?) in auctions. Or you might have seen second-hand wraps selling for prices (much) higher than they retailed for. Some wraps are very limited, the market value (second-hand selling price) is a matter of supply and demand…. with the supply being low and the demand being high the prices go up quickly. The market value of a wrap is not consistent, buying a wrap for an increased price might mean you will lose money once you decide to sell it again. On the other hand you could have found yourself a bargain which you can sell for a higher price even after months of wearing. It’s a risk you take. With woven wraps the second-hand market is where a lot of people will buy their wraps. Wraps that are already worn are softer and especially with blends that need some breaking in people are happy to buy it once it’s softened up instead of working on this themselves. Buying a wrap brand-new from a shop is off course the best option if you want full guarantee and service. There are brands around with retail prices around 50-80 euro, but you will probably find that a lot of woven wraps cost around 100-150 euro and than there are the ‘high end’ brands that have (much) higher retail prices. You’re the one who sets the budget, starting with a more affordable wrap is a great option, but if you only love the (more expensive) high end wraps, there’s no-one who would tell you that’s bad to start with. Ask other babywearers what they would suggest or what they love and all answers will be different. There are a lot of exciting blends out there and they all sound great. Airy, but supportive? Toddlerworthy? Perfect for summer? But the truth is: preferences for specific blends are very personal. Where your best friend loves silk, you might hate it. Even two wraps with the same blend can wrap totally different. Did you love the wrap with wool you borrowed from a friend? This doesn’t give you a guarantee that you will love every other wrap with the same wool percentage. If you want to start with an exciting blend, go ahead! But don’t be dissappointed if it’s not love. With origin I mean it as widly as you can imagine. The origin of the fiber, where it’s woven, the location of the company (or retailer) and everything else that comes to mind. There are some fair trade projects (Iike Girasol) and other brands have chosen local weaving mills and yarns. 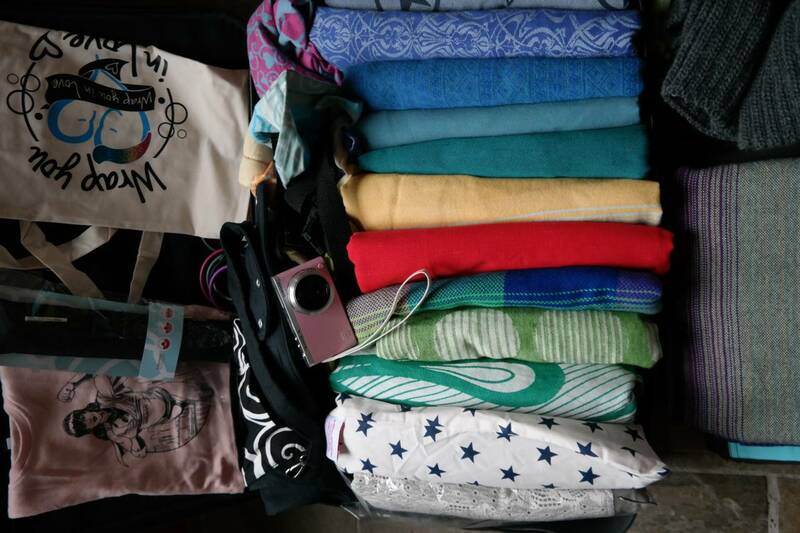 Do you want organic cotton? Certified? Some brands offer exclusive designs for specific retailers, don’t forget the exchange rates and the possible custom fees you have to pay when buying from overseas. It’s also great to invest in your local economy. Consider buying from a local retailer or brand that is located in your country. 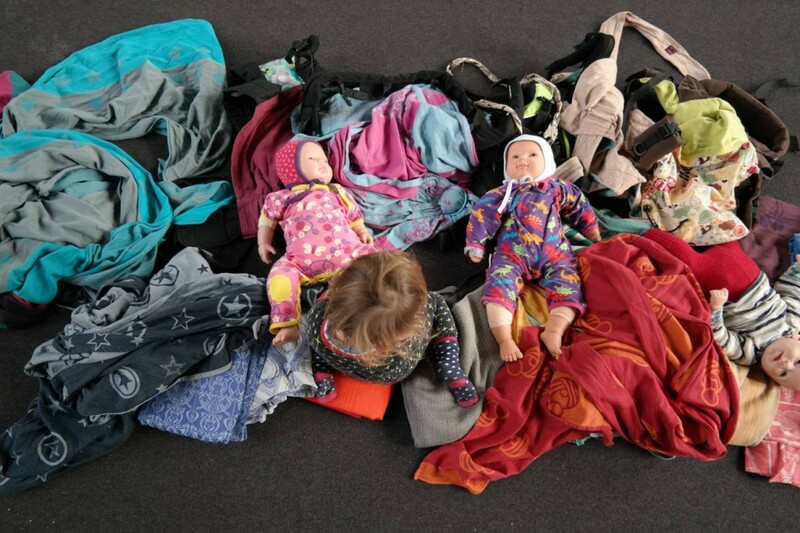 If you want to buy second-hand, you could try to find a local babywearing sale & trade group on Facebook (or maybe a babywearing forum for your country). Choosing the right size might seem confusing. Different brands offer charts and comparing them might show two totally different suggestions for your body size. Most parents start with a size 6. They look for a wrap to use for a FWCC and for most other (back)carries. Depending on your body size you can probably do those carries with a size 5 or you might need a size 7. If you prefer to start with less fabric, you can look at a shorter wrap. Short(er) wraps are very versatile too. I prefer a size 3 or 4 to use for the kangaroo carry & rucksack, or a size 2 for rebozo. Wearing wiki offers a great overview with different sizes & carries. Some brands run long, if you tried a wrap and liked the size, it’s always best to measure it (or have the owner measure it) to make sure the wrap you ordered wrap has (at least) that length. This is the most important value. If you love the looks of your (first) wrap, wrapping with it will be much more fun! If you follow brands on Facebook you will see pictures they share and you might have seen babywearing pictures on Instagram or Facebook with designs you like. There are some great databases where you can browse through wraps that have been released. You can search on keywords (like ‘fox’ or ‘apple’), on colours, design name or brand. Slingofest is one of these websites and might be worth a look! If you’re new to wrapping a wrap with (not mirrored) stripes or a different coloured toprail can be helpful, this way you can easily tell the rails apart and see which part of the wrap you’re tightening. If you don’t like stripes or a grad, don’t worry. You can learn how to wrap with every design, no problem!